We are excited to be taking some really big orchid specimens to the Malvern International Orchid Show at the Three Counties Show this evening (look out for news updates). One of our specimens in this lovely warm growing species from the Himalayas. 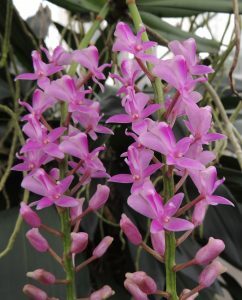 We currently have a large number of dramatic orchid species related to Vanda in Warm Asia. Micropera rostrata is native to Assam and the Eastern Himalayas where it grows pendulously in warm forest that has very wet summers and a dryer winter. We find that in cultivation the species enjoys constantly warm conditions in Warm Asia and we keep it watered throughout the year as the species never really stops growing. Summer flowering is very reliable indicating daylight length is the flowering trigger. 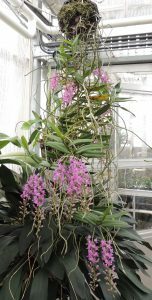 The species was originally included in Aerides which makes sense from the way that it grows and flowers but the flowers them selves have a very unusual and distinctive lip and column leading to the very appropriate name rostrata which means ‘beaked’. We have had the plant for lcose to twenty years and it has taken a while to start branching and producing multiple spikes but it is now a real spectacle.